The goal of our coastal wetland research program is to understand the ways in which tidal marshes can keep pace with sea-level rise through biological feedbacks to marsh surface elevation. In particular, we examine how simultaneously changing external forcing factors, such as elevated CO2, sea-level rise, nutrient enrichment, storm sedimentation, or fire, affect marsh processes that regulate organic matter accumulation, vertical accretion, or the capacity for upslope migration. We combine greenhouse and field studies to (1) identify biophysical processes regulating marsh surface elevations; (2) examine impacts of disturbance or restoration on marsh structure and function; and (3) help develop models that inform adaptive management and restoration strategies. ​1. Forecasting tidal marsh responses to climate change and monitoring elevation change using Surface Elevation Tables (SETs). The video below by Dr. McKee highlights aspects of our global change research. ​2. Testing different restoration strategies aimed at recovering ecosystem functions in a world of rising seas using our weir approach. Funding from NOAA NERR Science Collaborative. Coverage of our approach to manipulate sea-level rise was highlighted in numerous media outlets from Science Daily to the local Tuscaloosa News. Read more about it here. Funding from EPA via Gulf of Mexico Foundation. KRIS News in Corpus Christi, TX covered our study at the Grand Bay NERR. ​Read more about it here. To a lesser extent, we conduct research in local freshwater wetlands with the goal of understanding how plant communities respond to changes in their environment, interact with each other, and influence ecosystem processes. This work includes investigation of plant responses to invertebrate grazing, to competition with other plant species, and to water level fluctuations. We have examined how changes in community composition and liter quality influence patterns of nutrient or material export from beaver-formed wetlands embedded within larger stream networks. Starr, G., J. Jarnigan, C. Staudhammer, and J.A. Cherry. 2018. 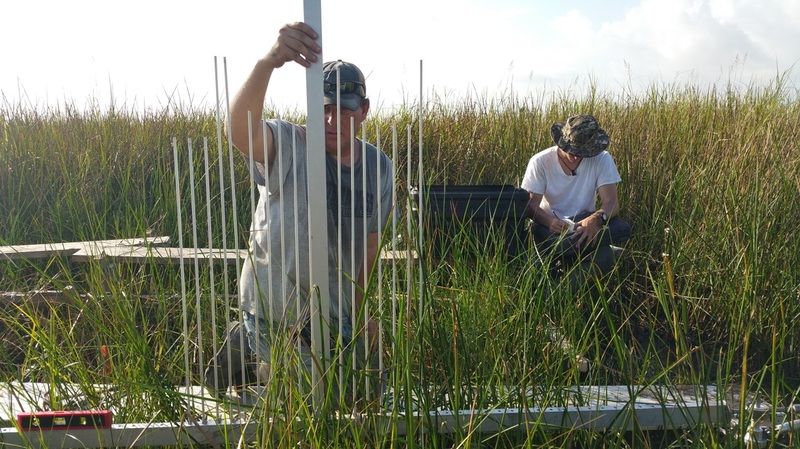 Variation in ecosystem carbon dynamics of saltwater marshes in the northern Gulf of Mexico. Wetland Ecology and Management. https://doi.org/10.1007/s11273-018-9593-z. Lee, P.O., Cherry, J.A., Edmonds, J.W. (2017) Organic nitrogen runoff in coastal marshes: Effects on ecosystem denitrification. Estuaries and Coasts. 40:437-446. doi: 10.1007/s12237-016-0161-6. Jones, J.A., Cherry, J.A., and McKee, K.L. 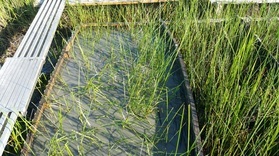 (2016) Species and tissue type regulate long-term decomposition of brackish marsh plants grown under elevated CO2 conditions. Estuarine Coastal and Shelf Science. 169:38-45. doi: 10.1016/j.ecss.2015.11.033. Cherry, J.A., Ramseur, G.S. Jr., Sparks, E.L., and Cebrian, J. (2015) Testing sea-level rise impacts in tidal wetlands: a novel in situ approach. Methods in Ecology and Evolution. 6:1443-1451. doi: 10.1111/2041-210X.12441. Conner, W.H. and Cherry, J.A. (2013) Plant productivity – bottomland hardwood forests. In Methods in Biogeochemistry of Wetlands, K.R. Reddy and R.D. DeLaune (eds). Soil Science Society of America, Madison, WI. Woodrey, M.S., Rush, S.A., Cherry, J.A., Nuse, B.L., Cooper, R.J., and Lehmicke, A.J.J. (2012) Understanding the potential impacts of global climate change on marsh birds in the Gulf of Mexico region. Wetlands 32:35-49. Cherry, J.A. 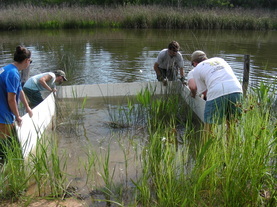 (2011) Ecology of wetland ecosystems: water, substrate, and life. Nature Education Knowledge 2(1):3. Cherry, J.A. and Gough, L. (2009) Trade-offs in plant responses to herbivory influence trophic routes of production in a freshwater wetland. Oecologia 161:549-557. Cherry, J.A., McKee, K.L., and Grace, J.B. (2009) Elevated CO2 enhances biological contributions to elevation change in coastal wetlands by offsetting stressors associated with sea-level rise. Journal of Ecology 97:67-77. McKee, K.L. and Cherry, J.A. (2009) Hurricane Katrina sediment slowed elevation loss in subsiding brackish marshes of the Mississippi River Delta. Wetlands 29:2-15. Cherry, J.A., Ward, A.K., and Ward, G.M. (2009) The dynamic nature of land-water interfaces: changes in structure and productivity along a water depth gradient in the Talladega Wetland Ecosystem. Verh. Internat. Verein. Limnol. 30:977-980. Valentine-Rose, L.M., Cherry, J.A., Culp J.J., Perez, K.E., Pollock, J.B., Arrington, D.A., and Layman, C.A. (2007) Floral and faunal differences between fragmented and unfragmented Bahamian tidal creeks. Wetlands 27:702-718. Cherry, J.A. and Gough, L (2006) Temporary floating island formation maintains wetland plant species richness: the role of the seed bank. Aquatic Botany 85:29-36.